Today we're going to sing a Burt Bacharach song, Raindrops keep fallin' on my head. It's one of my most loved songs ever, it's sweet and easy to sing (it's impossible go out of tune!) and it's one of the first memory of my life. Ok, it's a bout a tv commercial spot of a famous eau de parfum, Napoléon. There's a girl dancing with a cat in tuxedo, and this strange couple was dancing under a roof... Anyway, this is the commercial, I bet someone should remember it! 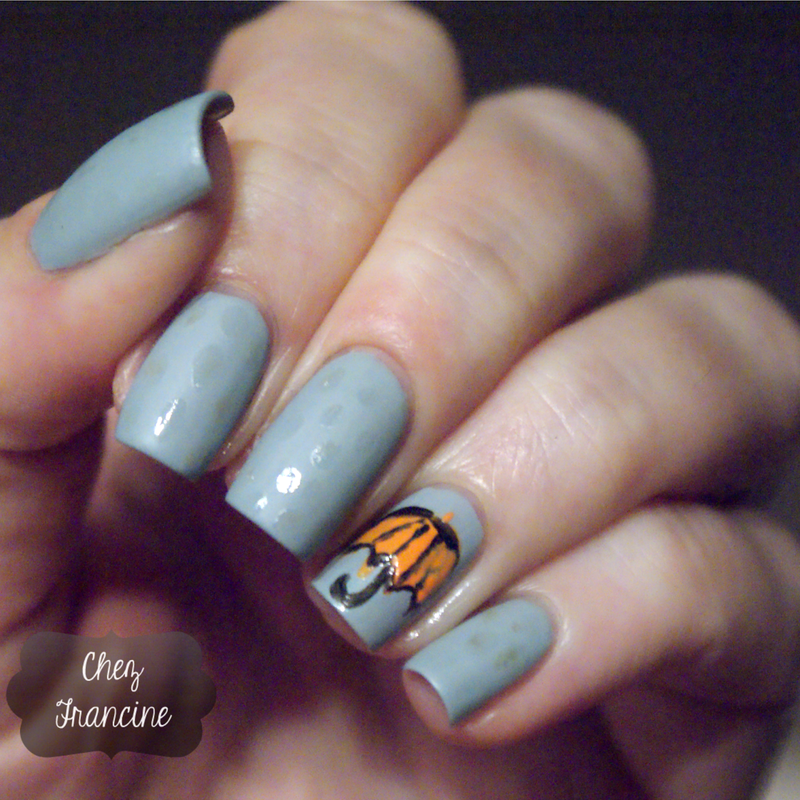 If you don't know the lovely Gianna #Nailstorming, I kindly suggest you to take a look at her blog and at her IG account. The first time I've seen this design I said myself it was perfect for Bacharach's song. Oggi siamo canterine e lo spunto ce lo dà una famosissima canzone di Burt Bacharach, Raindrops keep fallin' on my head. È una melodia dolcissima, facile da cantare ed impossibile da sbagliare, nonché uno dei miei ricordi d'infanzia più cari. Ricordate la pubblicità del profumo Gocce di Napoléon? La ragazza con l'ombrello che ballava assieme al gatto in frac sul tetto? No? Sicure? vabbé, andatevi a rivedere lo spot, poi ne riparliamo! Se non avete ancora dato un'occhiata al blog o al profilo IG di Gianna aka Nailstorming, vi consiglio caldamente di correre ai ripari! La prima volta che ho visto questo disegno ho pensato che sarebbe stato perfetto per questa puntata! I've started with two coats of an old nail polish, Eyeko Rain. 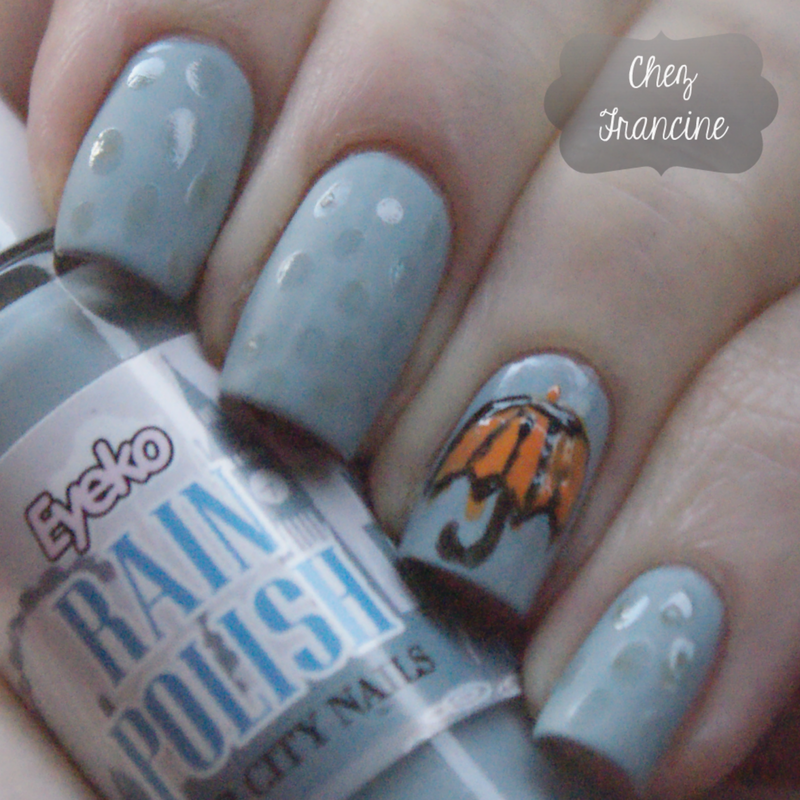 Eyeko sold nail polishes too, and Rain was one of the most wanted shades on the block. Nowadays I don't know if Eyeko is still on the raw or not, but I'm pretty sure they do not sell nail polishes anymore. Rain is a light grey with a blue hint. I do not think I have something similar in my stash, maybe Essie Parka Perfect? Who knows? Ricordate la Eyeko? credo sia ancora sul mercato, ma sono sicurissima che non produca più smalti. Rain era uno dei più richiesti, per via del bellissimo color grigio/azzurro, veramente particolare e all'epoca non ancora di moda. Credo che solo Essie Parka Perfect gli si avvicini, ma non ne sono sicura. Rain è una lacca vecchio stile. Due passate sottili e siete a cavallo. Once my base color was completely dried, I've painted an umbrella with Wet'n'Wild E045 Sunny Side Up and Essence the gel46 black is back. For the raindrops, I've matified all my nails but the ring with Deborah Mat Effect Top Coat, and I've made some irregular dots with KIKO Strong Nails using a detail brush. 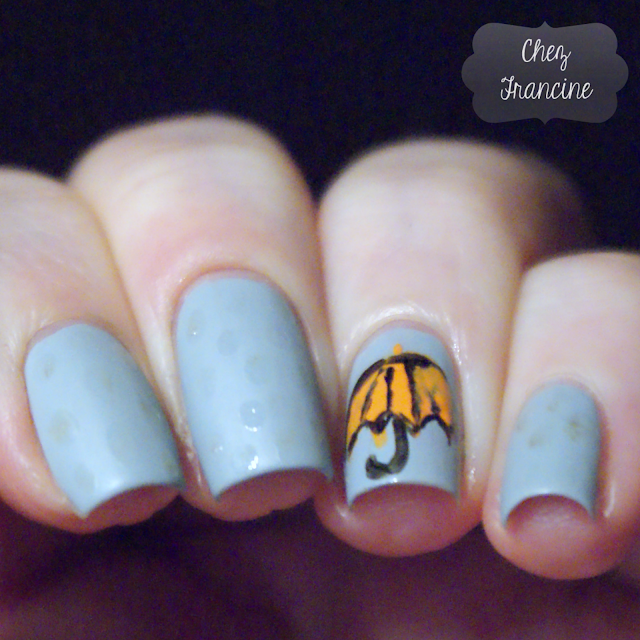 Sulle due mani di Rain ho steso una base opacizzante, Deborah Mat Effect Top Coat, anulare escluso. 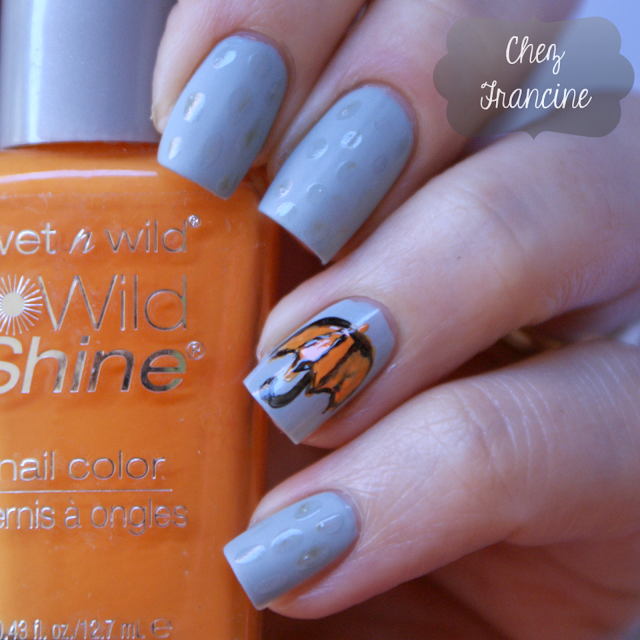 Con un pennellino da dettaglio ho disegnato le falde di un ombrello con Wet'n'Wild E045 Sunny Side Up e ho ripassato i controni con Essence the gel46 black is back. Sulle altre dita, ho creato le gocce di pioggia aiutandomi col pennellino di cui sopra e KIKO Strong Nails. Sadly, the weather wasn't good when I've took these pictures (it was a rainy day!) and I did not have the chance to redo this pattern again. Would you please turn a blind eye on it? Purtroppo il tempo non era dei migliori quando ho scattato queste fotografie, e non ho avuto l'occasione di rifare tutto daccapo. È vero che sarete gentili e chiuderete un occhio, per carità? Grazie per essere passate e a domani!